Bringing Kids, Adults & Animals together through Reading, Learning & the Love of BOOKS! Stop Bending Over Backwards Trying to Please! I bet you are wondering what all this ladybug stuff is about and I’m delighted and excited to tell you! A few years back, when I was going through a very difficult time in my life, a beautiful movie was released that not only changed my life forever, but actually saved it. “Irresistible.” said the Boston Globe, “A fun movie.” reviewed USA Today.” “Two thumbs up!” says Ebert & Roeper. Have you seen this movie? Did you go with a friend? Did you talk about it afterwards for days and months? Or refer to it years afterwards? Oh, yes! One of my all-time favorites! Remember the “ladybug quote scene”? One of my favorite scenes in the movie, was when Frances (played by Diane Lane) Frances stops by unexpectedly and was hoping to get some “cheer” from her friend Katherine, but instead she got somewhat scorned for being sad…”AGAIN”! Seeing her friend’s obvious frustration, Katherine lovingly shares, the above “ladybug quote”. So, “what does that mean”, you say? “I still don’t get it!” Well, I believe that it has such a profound meaning, especially for women. 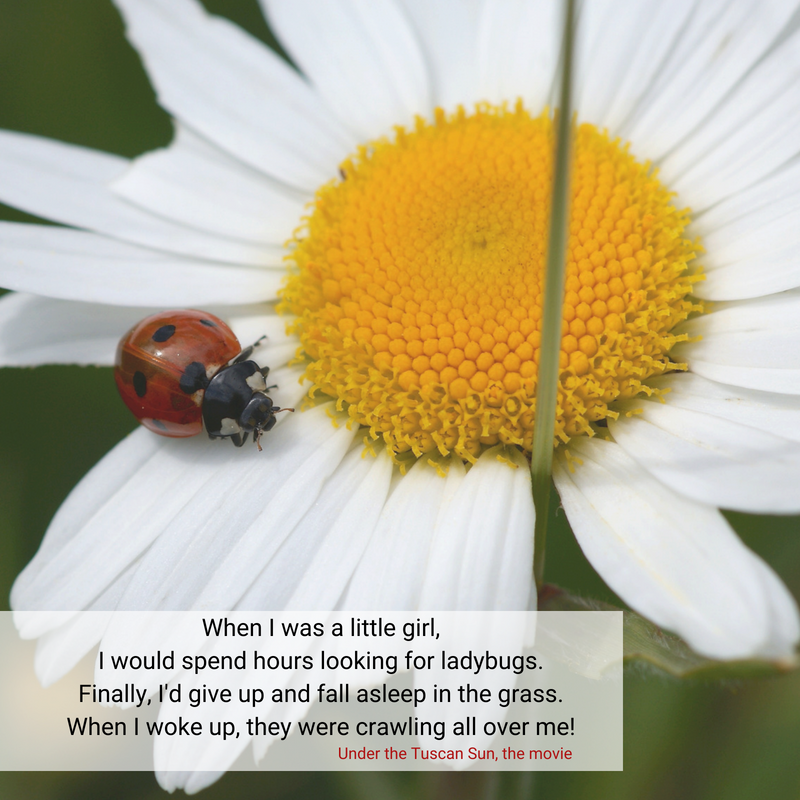 The ladybugs represent our hopes, dreams…what we wish for but don’t seem to be able to realize. the more you chase, the more they allude you. We don’t get there because in chasing our dreams, we are still painfully aware that they haven’t shown up yet! Then the disappointment sets in…and it just becomes a cycle of wishing and disappointment and to tell you the truth, (but we would probably not want to admit it to anyone) we are miserable! But there is a brighter side to all of this! and finally…that we really CAN realize our hopes and dreams…know who we are and love what we do every.single.day! If this has intrigued you in any way, I would love to offer you a FREE 15 minutes Discovery Chat with me to hear about what YOU are dreaming of! Sharing your dream with another brings it closer to reality! I promise it will be FUN! « What’s Happening at Ladybug Junction Farm? Passion & Enthusiasm for a Life Well Lived! What’s Happening at Ladybug Junction Farm? Why is Puppy Scents So Important?